While Wi-Fi security cameras are a super convenient way to monitor your home, understandably, some people might be nervous to use them. After all, a person's home is meant to be their sanctuary, so privacy is paramount. If a camera gets hacked, your private activities could be exposed. No hardware is 100 percent secure, so to mitigate your risk, you want to buy such cameras from reputable makers, such as Logitech with its excellent "Circle" cameras. You should avoid no-name manufacturers. 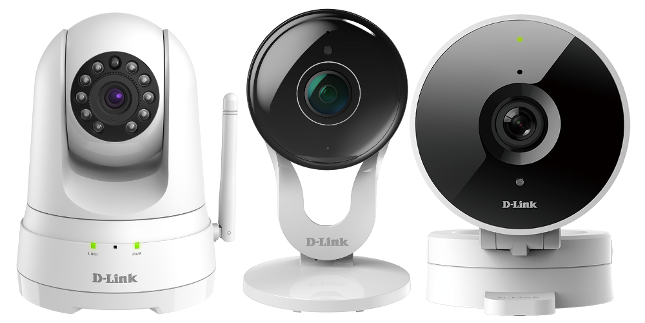 Today, a popular and reputable company -- D-Link -- unveils a trio of new Wi-Fi security cameras. They are shockingly affordable, starting at just $59.99. Fans of voice assistants will appreciate the Amazon Alexa and Google Assistant support. "Designed for a number of home monitoring needs, the HD Wi-Fi Camera (DCS-8010LH-US), Full HD Wi-Fi Camera (DCS-8300LH-US), and Full HD Pan & Tilt Wi-Fi Camera (DCS-8525LH-US) offer advanced features, including cloud recording options as well as third party integration capabilities with Amazon Alexa, the Google Assistant, and IFTTT at a compelling market price," says D-Link. The company further says, "To create a more user-friendly connected home experience, D-Link has created a new mydlink app which allows users to setup and manage their cameras all in the palm of their hand. D-Link users can watch the live view of their cameras from anywhere and receive triggered alerts when sound or motion is detected. For comprehensive surveillance, the new mydlink app continues to support free local recording via a microSD card as well as the option to use cloud recording -- with various subscription options." D-Link shares the following specifications and pricing. All three models are available immediately from various retailers. The company is also offering new cloud-recording options, with monthly pricing ranging from free to $9.99. If you don't want any video to be saved to the cloud, you can turn that feature off entirely. A microSD card can be leveraged for local storage too. Are you willing to put a security camera in your home, or are you too nervous about them being hacked? Please tell me your thoughts in the comments below.